most people seem to have some sort of story from high school that stands out in their mind as a low point. whether there was drama, or your most embarrassing moment, or extreme disappointment, things seemed to be the “end of the world” in high school. i thought i had reached the lowest point of my life during my senior year of high school. since i attended a fairly conservative christian school, we did not have school dances but rather formal banquets each year. this involved everything a prom does – fancy dresses, hair up-dos, corsages, limos, and dates – just swap the dance for the dinner. people started planning for this january event in september, since it was the only event of the year where people brought dates and therefore a big deal. 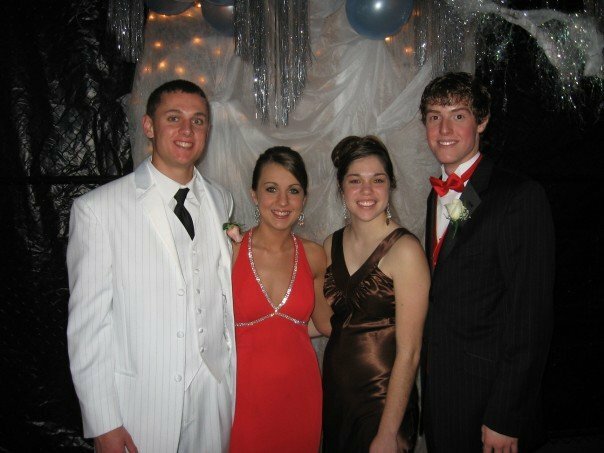 as a senior in high school, i had been going to the banquet since seventh grade, but had never had a date. my close friends told me that they were sure i would have a date for senior year, since a lot of people in our class were going together even just as friends, but they were wrong. i was still date-less. determined to make the most of it, i invested in what is today still one of my favorite dresses i have ever worn (other than my wedding dress, that is). one of my friends did my hair, and i showed up to the banquet driving my ford bronco (which high school me thought was pretty sweet, even if it was somewhat difficult to get in and out of with heels on). of course, when i walked in, i realized that all of the tables seated even-numbers of people (aka couples), so most of the tables with my friends at them were already full. i ended up sitting next to my high school crush and his date (definitely not ideal) and having to get my own drink instead of having a date bring it to me. after the event, most people were going out to a fancier restaurant to get dessert before going to a student-organized dance (let the record show that it was not school-sponsored). i watched my friends all hop into a limo the boys had rented. their parents had shown up to take pictures of them getting in, since it was a surprise, and i stood with them. of course it was raining, and of course i didn’t have an umbrella, so i shouted to them that i would meet them at the restaurant then ran to my car. however, i felt so left-out and lonely that i couldn’t bring myself to endure any more of being the only one without a date. so i just drove home. i kicked off my heels, put on pajamas, and cried while watching beauty and the beast. none of my friends even called to ask where i was and why i hadn’t shown up. that was the low point of my life at the time. and i didn’t understand why God couldn’t have changed things for me. did He even care about 18-year old girls and high school? looking back, i am grateful for my years of singleness. i am even grateful for the way high school played out. God used it to protect and prepare me for my relationship with eric. it changed the way i viewed relationships and changed what i expected in a significant other. loneliness deepened my personal walk with the Lord. it even provided me with a platform to relate to some of my girls through camp ministry and college ministry. God was intentional in the way He wove that part of my life together. i couldn’t see it at the time, though. i can laugh about it now, especially since i would have a pretty easy life if that is the hardest thing i ever have to go through. but i didn’t see the full picture, though high school sure felt like it was the only thing that would matter at the time. the israelites were the same way, except change the long dresses and limos into sweat and brick-making. moses came into egypt probably on the same kind of high you experience after summer camp or a college ministry conference. he had just experienced God through a burning bush, and he was ready to bring his people out of slavery. the people believed what God was going to do, and they were on moses’ side (exodus 4:31). however, after moses visited pharaoh and pharaoh refused his request, pharaoh significantly increased the workload on the israelites, who in turn got mad at moses. neither he nor the israelites saw the full picture. it’s scary to not be able to see the next steps. we can know and even believe the promises in Scripture that God is with us, He will never forsake us, He works all things together for good, He will carry out to completion the good work He began in you, etc. etc. but without knowing the “how” or the “when” – without understanding what He is up to – it can seem like He has forgotten us or He has made a mistake. God did the same thing right after the israelites were released from egypt. do you see how intentional that was? God told them to camp right in front of the red sea. where He knew they would be boxed in by the wilderness and the sea when the egyptians came pursuing them. He even told them why – that it was for His glory – but when the israelites saw the egyptians pursuing them, they freaked out. and i can’t tell you how often i have the same reaction with the Lord when i don’t understand. but the israelites didn’t see the full picture. and neither can we. the Lord prompted me to make a list reflecting times in my life where things haven’t gone my way or it hasn’t made sense, then to look at it from the perspective i have now. whether it is silly issues (such as high school formals) or serious issues (such as the path i took after graduating from college that didn’t seem like where i wanted to go), God was at work. He was intentional in each of those circumstances, showing me that i can trust Him with the full picture. obedience precedes understanding, and that can be difficult to embrace in the moment, but after recognizing ways God has shown up, i can take courage in moving forward, trusting that He will do the same. or at least, i should. i have a feeling i will be like the israelites and continually question what God is doing. but He isn’t done with me yet, and i know He will be patient and continue to work this trust-thing out in me. you should make a list, too. remind yourself that God knows the full picture and we just see a little sliver of the now.